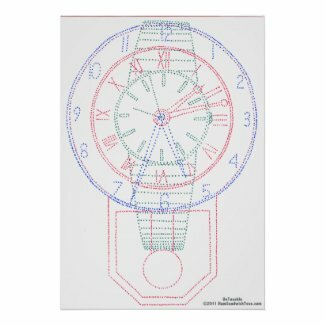 Multiple Clocks in a unique overlaid perspective give this design a cool look. It’s simple, yet intriguing! Go ahead – STARE AT IT AWHILE! Wouldn’t your Dog look cute with a Multiclock doggie tshirt? This design really makes a verrrry cool Necktie! Tote Bag – from tiny to jumbo, and even organic! Keychain – Full picture, Closeup – several different sizes and styles available! Buttons – several different shapes and sizes available!